William Sherrard Jr. | "Where we bring out the best in you!" This Scripture is a motivator for William Sherrard as he encounters life’s triumphs, failures, and accomplishments on his Christian walk. 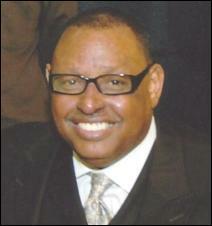 His work at St. Matthew Baptist Church is exemplified by following the leadership of his beloved pastor. He is married to Linda Sherrard and they are the proud parents of 3 sons, William III, Derrick and Christopher, 3 grandchildren, Cameron, Hailey & Jayden and a lovely daughter-in-law Holli. He delights in talking to, listening to, praying with and for and teaching the new members who unite with St. Matthew. He encourages them to become active participant and follows their growth as active in various ministries in the church. His contagious smile, even in the worst of times, has proven inspirational to many members of the Saint. He takes his work as Co-Chair of the Deacon Board, New Member Orientation Instructor, PACT member and Brotherhood as a calling from God, appointed by the pastor, seriously and attempts to serve as humbly and faithfully as he can. He enjoys studying the word, traveling, barbecuing, watching sports but above all spending time with his grandchildren. He concludes that God truly is his refuge and strength, a very present help in time of trouble.